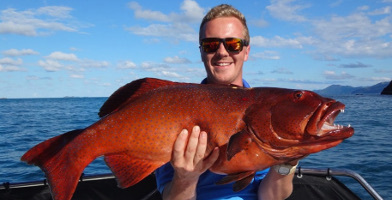 Treat the fishing fan you know to an epic adventure in the Whitsundays with a choice of half or full day fishing tours on the water to catch a whopper! With options available for either a half day or full day fishing charter departing from the Whitsundays' mainland hub of Airlie Beach, these gift vouchers allow the recipient to join friendly and knowledgeable local fishing guides, board a purpose-built fishing vessel with all the latest fish finding equipment, and be taken to some of the region's secret fishing hotspots. Simply choose from the gift voucher options below for the ideal present for the fisherman YOU know in this stunning part of Queensland today. 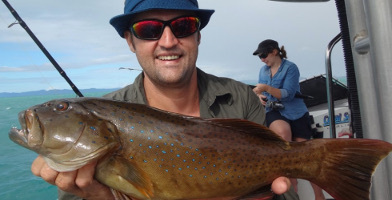 This Whitsundays half day fishing charter gift voucher offers a tour that heads out from Airlie Beach either at 8am or 1pm to catch trout, Sweet Lip & more. A comprehensive, full day fishing charter on the waters of the Whitsundays, this gift voucher is a thoroughly enjoyable trip that lasts from 8am - 5pm.